I thought I would share a tradition that we do at our house each harvest season that my family really looks forward to. It is called “thankful leaves.” This year we made our leaves into a tree. Usually we decorate our school room with the leaves all over the walls. Either way works but we sure had fun growing our tree this month. This year, because we live in a place that has fall colored leaves during fall (imagine that) we used real leaves. I asked Corbin to go outside and gather our leaves for our tree. He was very much up to the task. Meanwhile, I pieced some printer paper together so we could make our tree. He came in with the leaves and we got to work creating our tree. We colored it and then (of all things) crumpled it up. Corbin was shocked about the crumpling. Normally I am very neat and don’t want wrinkles so he sure loved this part! 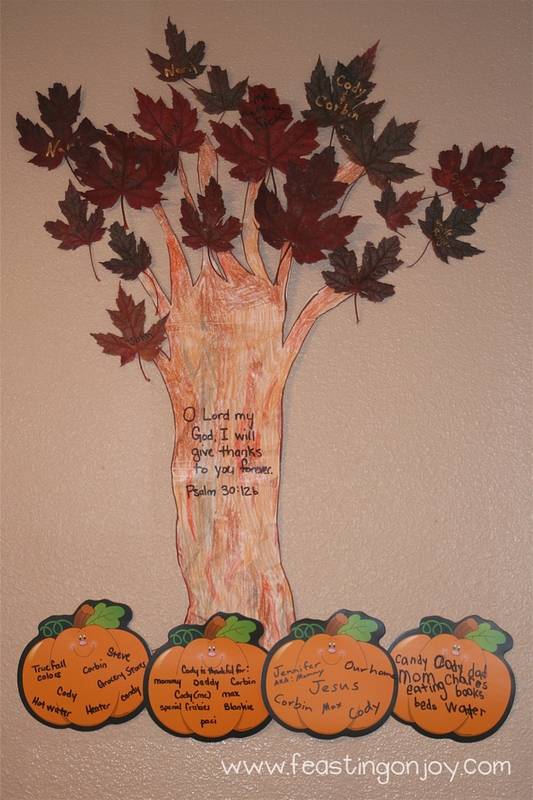 We picked our verse for our tree (Psalm 30:12b) and then put the tree on the wall in our dining room. I used sticky tack to put it up so we could easily remove it without marring the paint. I took the leaves that Corbin brought in and pressed them under some heavy books overnight so they were flat to write on. Cody – paci, bankie, Max (our cat), special friskies (and more.) Cody really got into it too. I got smart after a few of the leaves and started using a gold pen. The black pen really wasn’t showing up well. If we looked close we could see though. Tomorrow I will share with you another harvest tradition that Corbin can’t wait for each year. Stay tuned…. way more beautiful with real leaves, then the construction ones i’ve done in the past. you are inventively creative! I’ve seen this online with a wreath formation of leaves. The kids and I are doing a tree with the leaves being their hand prints this year. However, I LOVE the way this tree looks! great job, and thank you so much for sharing!